Some notable recent releases that have come my way have all pleased my ears. Don’t Lose Heart are the duo comprising Louisa Sadler and very familiar face and local music supporter on the city gig-going circuit Dickie Hartt, who have been gigging together for a couple of years or so in and around Norwich. 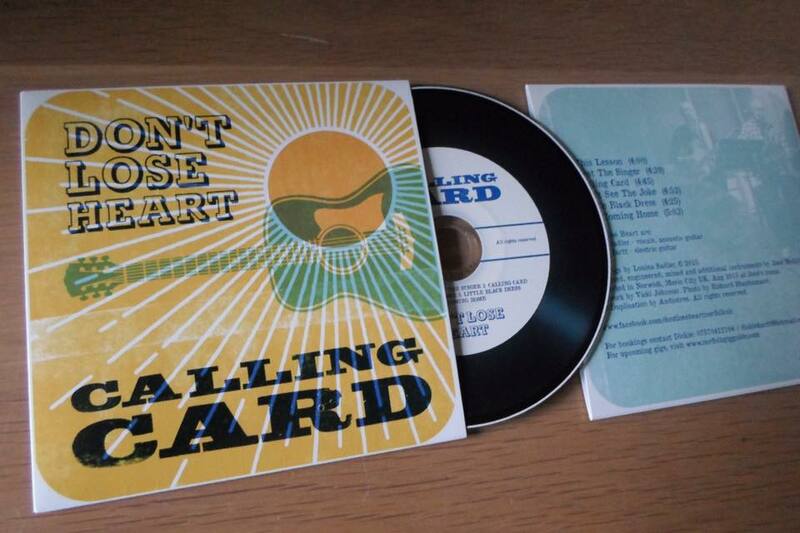 Their new EP “Calling Card” is beautifully packaged and hence only available as a physical CD with cover in the distinctive style of Printer Johnson. Get yourself a copy (£5) and you’ll see why, it’s a lovingly and well thought out, old-style presentation. I was speaking with Dickie some days ago about music artworks and how some just become indelibly attached to the music, so much so that when one hears the music the artwork appears in one’s head too. I was telling Dickie that was the case with this, and weirdly heard Bernard Butler say almost exactly the same thing on a BBC4 documentary about independent music labels some days later. Musically it is a real treat, fantastically produced by Jose McGill who has captured the tone and mood of Don’t Lose Heart just right. With the addition of bass, drums and altered arrangements it is obviously a much fuller sounding band feel than their live appearances and so opener This Lesson had a big impact on me on first hearing. I was blown away by such a great job by all. The production has really brought Lou’s lyrics and voice to the fore with some dark and subtle Americana guitar by Dickie giving the songs added depth and mood and together creating some beautiful melancholia. I even recognise the voice of Jose on backing vocals on Just the Singer. Glad to see one of my personal live favourites by DLH made the cut and appears on the record, Little Black Dress. Clocking in at just under 30 minutes it is more a mini-album than an EP and great value. This is a lovely release, a winning combination of great music, fine songwriting, sympathetic and understanding production, and the care and attention to detail of the physical presentation that is often overlooked these days. Professional and lovingly made it’s a very fine record full of soul. It’s been many, many months since I last heard Zacharie Lambert play although our paths have crossed many times at various gigs in that time and during the NS&V launch he kindly gave me a copy of his new EP The Drfter. He has been championed and promoted selflessly by my good friend Lisa in that time, who also saw his great talent and potential. She saw it very clearly however and seeing him at The Plasterers on Tuesday I totally witnessed what she saw too. As for the EP, I was immediately impressed with the confidence displayed on the first couple of songs. Apparently his voice has been compared with that of Billy Bragg in the past, which I think is a tad unfair, I much prefer Zach’s voice which if it reminds me of anyone at all (on record at least) it is occasionally of Roddy Frame but he has his own unique sound though they do all share a great songwriting talent. Without wishing to sound in any way patronising, there is something about Zach’s voice (and especially his lyrics) which belies his 17 years, it is the voice and feelings of a wise old soul. I don’t know where it all comes from but it is powerful. Seeing him play at The Plasterers last night for BFR was fascinating. He was great when I first saw him play about 18 months ago but the development in that time is astonishing. Displaying a friendly confidence the right side of swagger he silenced the whole pub who were rapt throughout the set. Interesting the way Zach discussed song meanings and feelings with the audience and also introduced a cover he was about to play for the first time. It was a mash-up cover of The Doors’ Soul Kitchen and Light My Fire which was wonderfully played and a set highlight for me, as well as some of his originals. The EP is officially launched with a gig at The Birdcage, Norwich on 22 October with Mount Hood, Turf Club Racebook, and Harry Buxton. 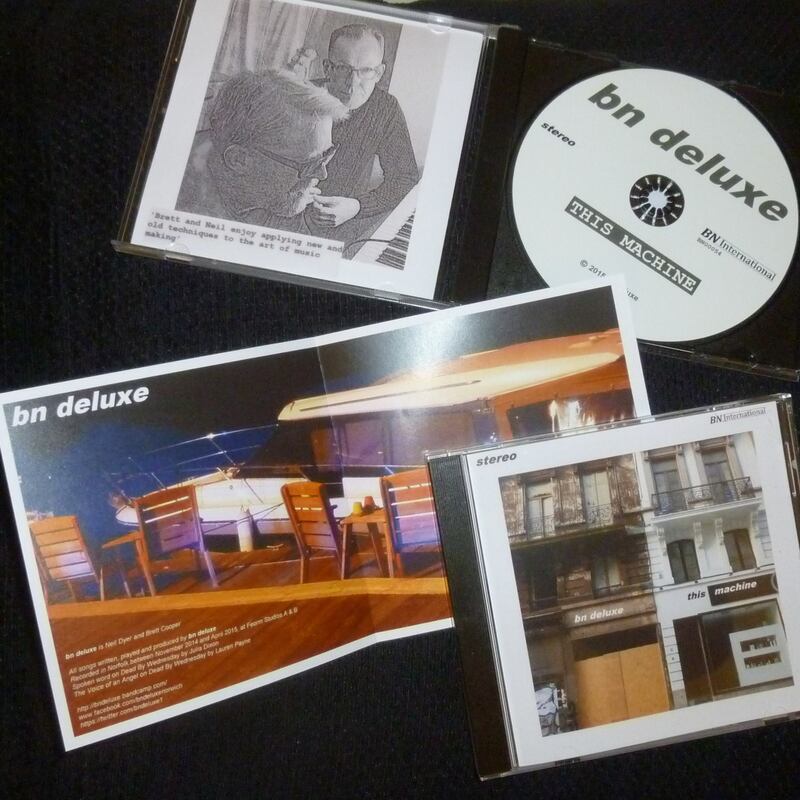 This Machine is the second album by prolific duo Brett and Neil who only formed bn deluxe last year. Of course they are old friends both being in one of my favourite Norwich bands on the early to mid-80s. Screen 3. I enjoyed the first album but think this one is better still, a wealth of influences on offer, from the heavy percussive sound of glam and definite hints of krautrock electronica and 80s pop melodies (Euphoria, etc.) it’s a very enjoyable album from Neil (vocals, guitar, bass, keyboards) and Brett (drums, bass, keyboards.) There is an 80s feel at times – the better aspect of the 80s, I hasten to add- but it is not pinned there and does feel relevant to these times, and especially in the lyrics, as it has a better production and sound than a lot of the typically over-produced music of that era. Emperor has something about New Order about it with Hook-esque bass. The physical CD can be found at Soundclash in Norwich for £5, or digitally from Bandcamp, iTunes, Amazon, Spotify, etc. This entry was posted in bands and new releases and tagged bn deluxe, Don't Lose Heart, norwich, Zacharie Lambert. Bookmark the permalink.